Former US Open champion Lucas Glover probably summed it up the best when he gave his ‘slant’ on proposed changes to the golf ball. The American professional suggested golf manufacturers should not shoulder any of the blame simply for ‘doing their job’. Rolling back the golf ball and the distance it travels has been a hot topic in the US this week and suggestions from the USGA have certainly stirred a few pots around the world. In short, the USGA stated that any further significant increases in hitting distances at the highest level were ‘undesirable’ and the governing body hinted that would also bring a further review. “This movement to roll back the golf ball seems very re-active by the USGA, just like the anchoring (putters) deal,” said Glover. And like the anchoring of the putter, which still brings rumblings around some of the US Tours, mainly the seniors, with suggestions that some players are still anchoring the putter to their bodies, thoughts of rolling back the golf ball have stirred up a veritable hornets’ nest. “[There are] too many variables in an outdoor sport to grasp what is actually happening,” Walker said. Certainly this debate will rage on for months to come and every winner (and loser) will probably be asked for their opinion on this hottest of topics. And why not? Tradition and technology is a subject that affects everyone who plays golf, and all of us who have a passion for the game. There’s always been a delicate balance between the advancement of the game and its enduring origins. Probably the best example of this deep-rooted debate and indeed how long it has raged was the fallout between pre-eminent club and featherie ball maker, Allan Robertson and his apprentice, Tom Morris, in 1849. Old Tom’s refusal to renounce the ‘guttie’ marked the dissolution of his mentor and playing partnership with Allan, and underscores the point that during every era, there are those who resist evolution and change, and those who embrace technology as part of the game’s heritage. After losing a match to Harry Vardon in 1910, two-time British Open Champion Willie Park Junior, reacted to the rubber-cored wound Haskell ball that pushed the gutta percha off the scene. And that was 118 years ago! It seems the golf ball has been the flash point for emotions about the game’s traditions and technologies for even longer than that. Try 160 years! 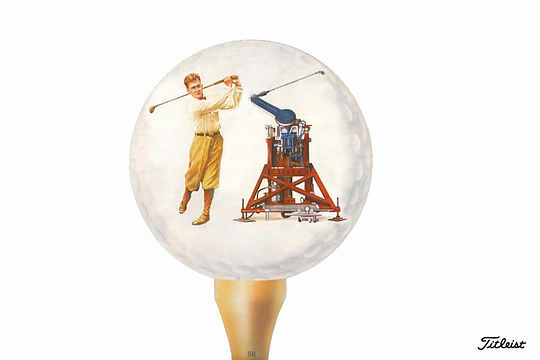 On the one hand, no single product has democratised the game more than the golf ball. On the other hand there are those who hold the golf ball responsible for whatever ills, real or contrived, the game may be facing. And just to put things further into perspective: In 1950, the beginning of the new decade post World War II, the game boasted eight million golfers playing on 10,000 golf courses with a total discretionary income spend on all things golf experience related of less than $1 billion. In 1980, with the creation and growth of the western middle class and the growth of golf in Japan, among other variables of period prosperity, the metrics revealed 30 million golfers, over 20,000 golf courses and a total discretionary spend on the aggregate golf experience of $18-$20 billion dollars per year. Thirty years later, it was no longer just the game of golf. The game of golf has become the business of golf with 55 million golfers, over 31,000 golf courses and some $75-80 billion dollars per year spent on the aggregate golf experience. And just to keep you updated even further, in 2016 there were approximately 48 million golfers, over 33,000 golf courses…and $85 billion spent. Additional golfers meant a need for additional golf courses. Additional golf courses required land, capital, developers and architects. Developers and architects needed a story to market their golf courses. So welcome to the Yardage Race Era. Titleist believes there has been no evidence to suggest that the game is harmed. During every era in the game’s history, there have been those who have resisted evolution and change, and those who embrace change as part of the game’s heritage. Yet some in the industry call for a “solution.” According to Titleist, a uniform tournament ball is not a viable solution as it favours some players’ launch conditions over others. One ball does not fit all, any more than one driver with uniform specifications fits all players. Who makes the decision on the specifications of a uniform ball and whether it will optimise performance for a player like Dustin Johnson or Zach Johnson? For those who propose a uniform ball that will benefit a lower swing speed player in order to achieve “equality,” why should the higher swing speed player be penalised or be required to make swing adjustments because he hits the ball farther? How is this a true test of skill? A player’s ability to choose and optimise equipment has been an intrinsic part of the game’s time-honoured traditions. Titleist do not believe that a golf ball rollback is a solution or even necessary. While some advocates think that this will impact the longest hitters, a rollback will more adversely impact shorter players. A 10 per cent rollback would mean less to a player like Dustin Johnson than it would for a player like Zach Johnson. In theory, Dustin’s driving distance average in 2017 would have gone from 315 to 284, compared with Zach’s going from 287 to 258. Maybe if we barred some of these long hitters from spending so much time in the gym building up their muscles to hit the ball further then we wouldn’t even need to be having this debate. Or we could make the fairways more narrow and the rough deeper. Now isn’t this game hard enough, without making it even harder for the man in the rough?